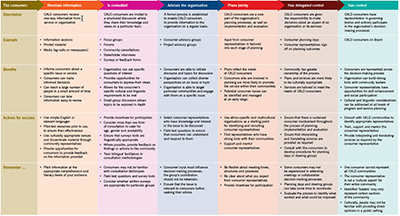 This table lists a range of strategies that enable current or potential consumers to participate in service planning and decision making. When deciding which strategies to use, you need to consider (a) your organisation’s capacity and readiness to involve consumers in decision making and (b) the consumer group’s capacity to participate at different levels. Additional considerations for CALD communities are included. Download the PDF version of Consumer Participation Strategies.